Damnedest thing I’ve seen in a long time… dumb beasts indeed. Shot hand held at F5.7, 1/8th, ISO80. Through two layers of dirty glass and one layer of screening… Gotta fix that. The monarch butterfly has it bad. Fortunately, we have a solution. As part of our Toronto-based Homegrown National Park Project, we’ve #GotMilkweed. This year the number of monarchs overwintering in Mexico hit an all-time low. Severe weather and the disappearance of milkweed (the plant they depend on) along their migratory path are making an already epic journey downright dangerous. There are even doubts that the monarchs will make it back to Canada! That’s why we launched the #GotMilkweed earlier this month. We’re planting a milkweed corridor through the City of Toronto. And the response so far has been amazing! Torontonians bought almost 1,000 milkweed plants in the first few days and are close to double that amount now. And hundreds of nice folks like you contributed $25 to buy plants for our volunteer Homegrown Park Rangers to plant in local schoolyards and parks. The Toronto Star even splashed the story on its front page. Want to help?Torontonians can order milkweed now, while supplies last. When spring finally arrives, plant them in your yard or on your balcony. You can even become a butterfly “block captain” and inspire your neighbours, local schools, stores and churches to do the same. Not from Toronto? No worries. You can check in with local conservation groups and nurseries in your community. Here is a good list of local nurseries. If they don’t stock milkweed species native to your region, politely ask them to start. The monarch butterflies have it bad. Help us bring them back, one milkweed plant at a time. Will we celebrate Earth Month? Support the David Suzuki Foundation! Our dedicated team ensures that even the smallest contributions go a long way towards protecting nature in Canada. Invite pollinators to your neighborhood by planting a pollinator friendly habitat in your garden, farm, school, park or just about anywhere! 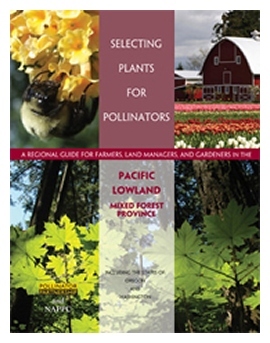 Starting on Page 16 of the planting guides you can find lists of plant names that will attract pollinators and help you build beautiful pollinator habitat! These guides were funded by the National Fish and Wildlife Foundation, the C.S. Fund, the Plant Conservation Alliance, the U.S. Forest Service, and the Bureau of Land Management with oversight by the Pollinator Partnership, in support of the North American Pollinator Protection Campaign. To learn more about why planting for pollinators is important, click here. Our ecoregional planting guides are tailored to specific areas of the U.S. You can find out which ecoregion you live in by entering your zip code at link above.